If you see yellow teeth when you look in the mirror, you’re not alone. Your natural tooth color is affected by a variety of factors throughout your life including your tobacco habits, the foods and beverages you consume, and the accumulation of hardened tartar deposits. Trauma to a tooth that causes nerve death will also result in discoloration. The process of aging discolors your teeth, too. It’s even possible to be born with teeth than are more yellow or gray than usual. You may not be able to control all causes of discoloration, but teeth bleaching and bonding can give you a gleaming white smile. Teeth whitening or bleaching can be performed either at home or your dentist’s office. Teeth bleaching whitening gels containing carbamide peroxide work by oxidizing stains. At-home whitening begins with your dentist making an impression of your teeth to create custom-fitted trays that maximize your tooth enamel’s exposure to the whitening gel. To treat your teeth at home, you’ll fill the trays with gel, and wear them for about two hours. This process is repeated daily for several weeks. 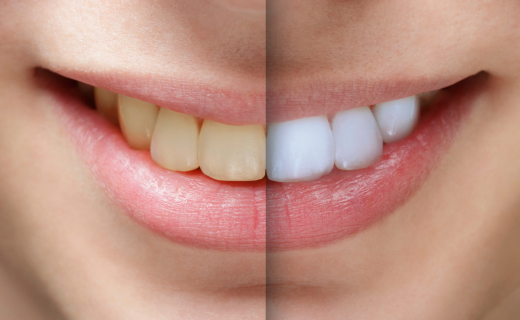 When supervised by your dentist, at-home whitening delivers great results. If whitening procedures aren’t enough, bonding can restore your smile to perfection. Bonding teeth with composite materials involves shaping and preparing your natural tooth, matching your tooth color, and applying a thin layer of composite resin to the entire surface. The new veneer is then shaped and cured with a special light. Porcelain veneers are created in a lab using impressions of your teeth. Both techniques provide an effective way to make unsightly stains a memory.